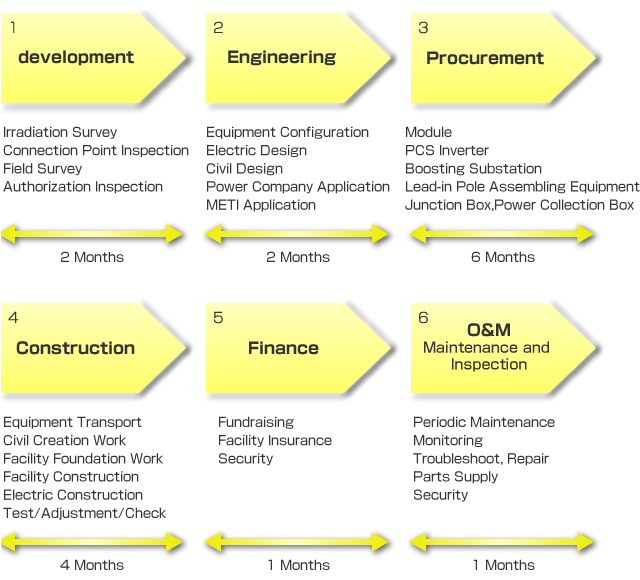 Design and Construction of Mega Solar｜Japan Electric Power Service Co., Ltd.
For solving Japanese energy problems and maintaining healthy status. We have many records from solar facility for general house appliances to Mega Solars, and have engaged this business since 2001. In many cases, the installation of power plants is done by people other than electric constructors. But, because we are the professional of electric engineering work, customer can trust our skills for best solar power generation. Frame installation to farmlands and parking lots, Panel installation of each manufacturer, Installation of inverters (power conditioners), Installation of boosting transformer facilities, Installation of PCS room, Installation of lead-in line pillar. The location of electric power supply is very important when installing solar power generation. It begins from checking of grid-system. And in case of farmlands, the feasibility of farmland conversion (change of land usage purpose) is also an important factor. 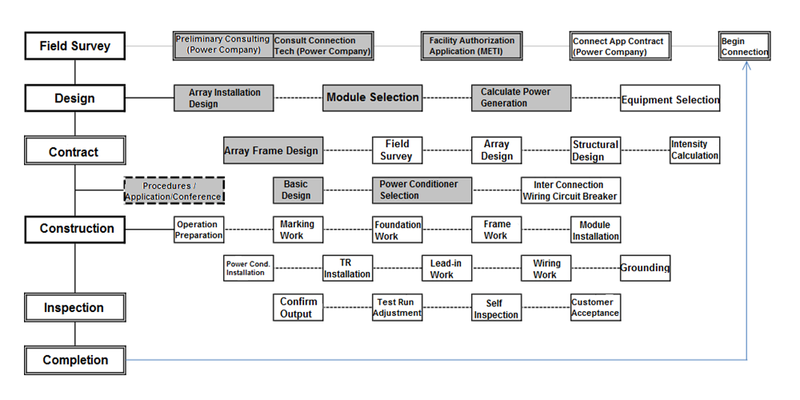 Professional designer will gather field survey results and create effective designs for maximum power generation and for compatibility with substations, extraction of power generation efficiency. Then designer will decide the facility specification such as area the scale of facility. Plant design will be made based on above. And documents for the Ministry of Economy, Trade and Industry (METI), power companies/Agriculture Committee, and etc. is made, then necessary process is taken by them. - Check the generating state of circuits and arrays of each panel. damage by such as lightning? twists from strong wind. State check of the base. – Indispensable especially for plant at outdoor, open field.